Service providers and enterprise data centers are undergoing an infrastructure transformation to achieve higher levels of performance and scalability that may explain why the demand for 100G network is always on the rise. Optical transceiver, therefore, is usually considered to be a vital component to ensure the flexibility and reliability of the whole system. 100G transceivers have become a preferable alternative for those bandwidth-hungry applications in data centers to accelerate data flow. In this article, we will introduce several 100G transceivers which are commonly seen on the market. And emphasis will be put on the 100G QSFP28 transceiver. There exist 100G CFP transceiver, CFP2 transceiver and CFP4 transceiver on the market. The CFP transceiver comes out firstly. It was designed just after SFP interface, but it is significantly larger to support 100 Gbit/s data rates. While the electrical connection of a CFP transceiver uses 10 x 10 Gbit/s lanes in each direction (RX, TX), the optical connection can support both 10 x 10 Gbit/s and 4 x 25 Gbit/s variants of 100 Gbit/s interconnects. With improvements in technology, CFP2 and CFP4 specifications have appeared to allow higher performance and higher density. Having similar electrical connection with a CFP transceiver, CFP2 transceiver and CFP4 transceiver specify a form-factor of 1/2 and 1/4 respectively in size of a CFP transceiver. 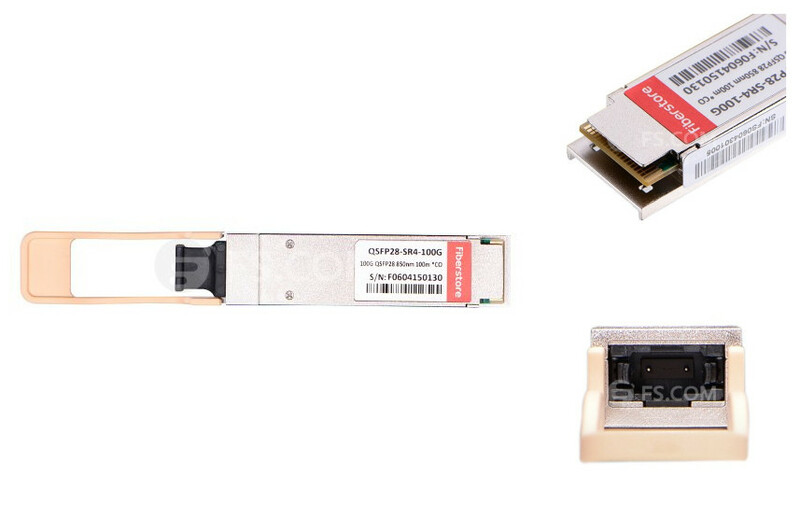 These three modules are not interchangeable, but would be inter-operable at the optical interface with appropriate connectors. And here comes the dominate 100G transceiver—100G QSFP28 transceiver, which is implemented with four 25 Gbit/s lanes. With an upgraded electrical interface, it is capable of supporting signal rates up to 28 Gbit/s, thus making it as easy to deploy 100G networks as 10G networks. Moreover, it has a strong ability to increase density, decrease power consumption, and decrease price per bit. With QSFP28, the way to migrate to 100G can change from 10G-40G-100G to 10G-25G-100G or 10G-25G-50G-100G, which can largely simplify the cabling in data center and effective decrease the cable density and the cost. Basically, there are two types of QSFP28 transceiver: 100g sr4 for short range transmission up to 100 m and 100g lr4 for long range transmission up to 10 km. The following diagram illustrate some detailed information of each type. What Can We Benefit From QSFP28? Giving a look back to the evolution of 100G modules in the past few years, all these changes are closely related to factors like power and cost, which matters a lot to every data center and server room. Thus, the reason why 100G QSFP28 emerges is partly explained. Then, what exactly can QSFP28 bring to us? Higher Port Density: The first generation of 100G transceiver is CFP, which is very large. When it comes to CFP2 and CFP4, the next generation of 100G modules, their sizes decrease a lot. With the same footprint and face plate density as QSFP+, QSFP28 is even smaller than CFP4, and its high port density is also an overwhelming advantage. Generally, up to 36 QSFP28 can be installed on a 1RU switch on the front panel. Lower Power Consumption: Compared with other 100G transceivers, QSFP28 requires the lowest power for transmission, which could be less than 3.5 W. While for other 100G transceivers, the power consumption ranges from 6 W to 24 W.
Lower Cost: QSFP28 is able to save considerable amount of money with higher port density and lower power consumption. In addition, QSFP28, implemented with four lanes, increases the transmission capacity of every lane from 10G to 25G, which can effectively decrease cost for each bit. With higher port density, lower power consumption and lower cost, QSFP28 offers an optimum and feasible alternative for 100G network data transmission, especially for those large scale data centers and carriers. Hope this article could assist you in choosing the right transceiver from 100g qsfp28 transceivers modules manufacturer to achieve smooth migration to 100G. This entry was posted in XFP/GBIC/X2/XENPAK/PON SFP/3G SFP and tagged 100G QSFP28 transceivers, 100G transceivers, QSFP28 LR4, QSFP28 SR4 on August 20, 2016 by Aria Zhu.